The PoveyBrothers windows in the sanctuary consist of 2 main groups. The first is a set of 12 "medallion style" windows ranging along the walls of the lower part of the sanctuary and in the narthex. They depict scenes from the life of Christ. 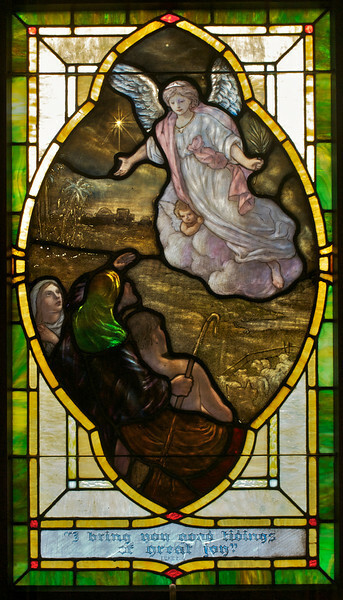 In this one the angel is proclaiming the news of the birth of Jesus to the shepherds. If you look at it close up you will see places where the paint is wearing off.